The one-day course suits most people, and is planned for enough time for you to go through all the important stages of French Polishing. Work on our practice boards and on items you bring along. By the end of the day you will have created a range of surfaces, including matt, satin, and a high gloss 'piano' mirror finish. One-to-one tuition throughout the day. (9.00 a.m. to 4.00 p.m.) This intensive one-to-one tuition means you can achieve what in a group would take much longer. Gift Vouchers available if you want to give a unique gift to someone. The two-day course covers everything in the Standard Course, but more time allows each stage to be carried out in greater detail, and there's time to progress on several larger items that you may bring with you. Related skills like grain-filling and staining are covered in more detail. This means that the final result will be to take the surfaces to a more advanced stage of the process. But it is important to realise that to some extent you will be repeating processes and re-inforcing what you have already learnt on the first day, as French Polishing is a repetitive process. Most students feel able to do this at home, rather than under supervision! Read some comments about the course from past students. Our French Polishing Course offers one-to-one tuition, to a professional level, we guarantee you will learn all the techniques in detail, without the wasted time that often occurs with a larger group of students. French Polishing is the ancient technique of applying a varnish made from liquid-shellac on to wooden items. This can produce a range of finishes, either 'matt', or 'satin', or a 'high gloss mirror finish', with a deep, crystal-clear reflection. Our unique course will teach you this traditional skill, not simply a "few coats of shellac and then a covering of furniture wax" that unfortunately these days often pass for "French Polishing"! You will learn: preparing surfaces, grain filling, staining, sealing, skinning in, bodying up, stiffing, spiriting off, glazing and burnishing, to produce a finished result consistent with the style and period of the piece. You will be able to create a range of surfaces, including matt, satin, and high gloss 'piano' mirror finish. Courses run throughout the year, and no previous experience is needed. The dates are arranged individually to suit you, and we normally teach on a one-to-one basis, but can cater for two if you want to bring a friend. French polishing is an enjoyable and rewarding skill to learn; you can refurbish or up-cycle almost any wooden item to look its best. French Polishing is an extremely tactile operation, and the difference between a bad and a good result depends entirely on understanding how to manipulate the shellac to produce the required result. The ratio of shellac : oil : alcohol in the polishing pad or' rubber' is important, and the proportions change as the polishing process continues. The amount of friction between the pad and the wooden surface is important to get right, and the sound the rubber makes on the surface tells the polisher if the ratio of these ingredients is correct. Grain filling open pore woods is another area that is difficult to get right. What is the best method of filling the grain? How do you do this well, yet keep the beauty of the wood surface clear and with a deep lustre? What is the ideal way to make up French polishing rubbers and what size and shape should they be? What is the best kind of shellac flakes to make polish from and should you buy it read-mixed or blend it yourself? 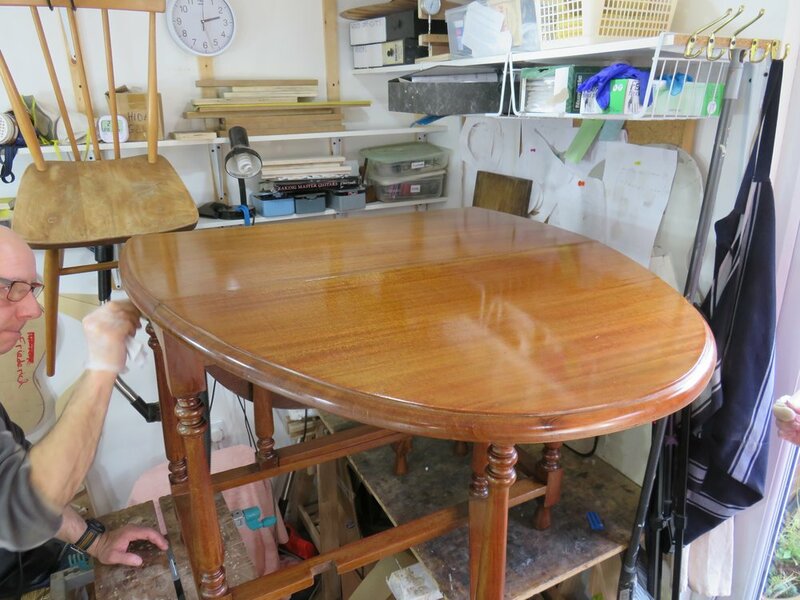 ABOVE: Piano tuner Daniel Randall wanted to add French polishing to the service he offers his customers, so he attended the course with Roy and above is the result - before on the left and after on the right. 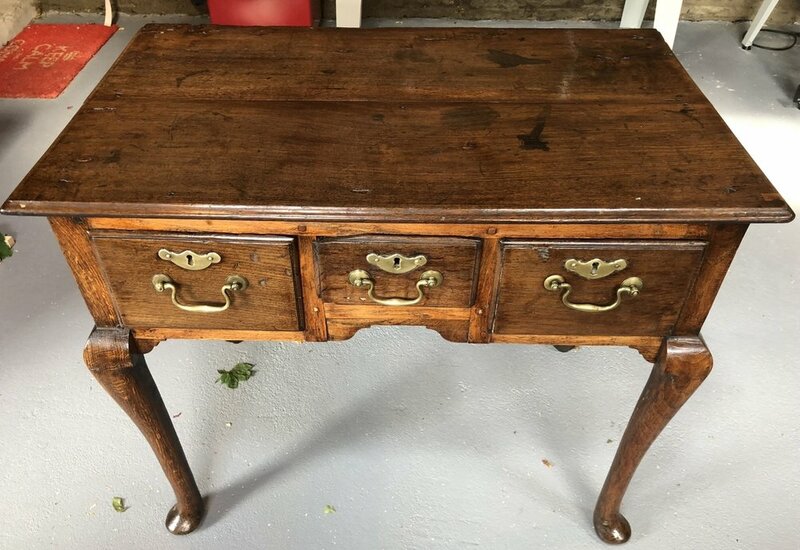 French Polishing can be taught on its own, using our practice boards, but it's best if you can bring along suitable items; - a dining chair, jewellery or writing box, small chest of drawers or table etc. to polish as well. Then we can cover all the processes involved in polishing; both on completely new surfaces, as well as cleaning and renewing the old patina found on antique furniture, or the restoration of a period item where you want to retain the old patina but give new life to the surface finish. French Polishing: types of shellac polish, ebonising, rubbers, wads, fads; stains and colouring; traditional grain filling with pumice powder and shellac; other grain filling techniques, methods of filling and disguising cracks and blemishes, sealing, bodying up, stiffing, cutting back, spiriting off, burnishing and many little-known trade skills are revealed. Restoration: degrees of stripping, from minor removal of old wax etc. without damaging underlying surface finish through to severe cases where chemical stripping is required. Repairing marks, blemishes and indentations, steaming out dents, staining methods and use of pigment powders. Tasks: Prepare work pieces (practice boards) and items of furniture etc - cleaning, de-waxing as needed; sealing coats of shellac; rubbing down and re-coating; understanding polishing sessions; traditional method of grain filling open pore wood using pumice powder and shellac, as well as other pore-filling techniques for different situations. Make up rubbers and build up polish layers (bodying up), cutting back between coats; stiffing, spiriting off; polishing patterns; use of oil; adjustment of polish concentrations; burning off oil; burnishing methods and creams; how to achieve matt, satin and gloss surface finishes; learn how to cultivate a top quality, beautiful surface; use of stains, fillers, shellac sticks. How to avoid common problems. French Polishing is a skill that is best taught on a one-to-one basis. A two-day course (or longer) can also be useful if you want to learn about restoration; woodworking, repairing veneers and damaged wood, taking apart and re-gluing chairs, sharpening and using cabinet scrapers and woodworking tools etc. This can be included with French polishing on the same course if you wish, or separately. 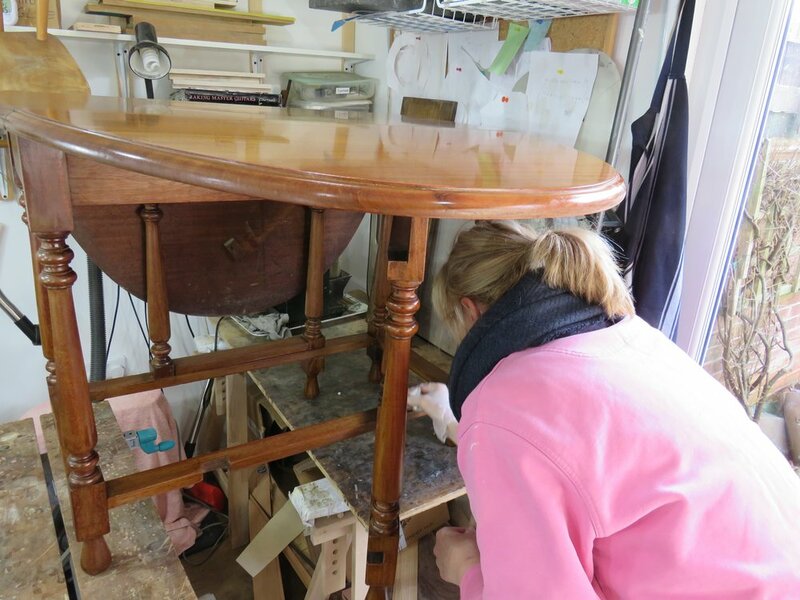 Read about our Furniture Restoration course. French Polishing can produce a range of finishes, from matt, to satin, to full high 'piano' gloss. Our course teaches you how to obtain all of these. above: Oak gateleg table top with severe water mark damage, shown before and after French polishing to obtain a satin lustre finish.